The Prime Minister has released a statement following the death of the Polish President Lech Kaczynski and his wife in a plane crash in Russia. They were among scores of people who were killed when the aeroplane they were travelling in crashed near the city of Smolensk on Saturday. 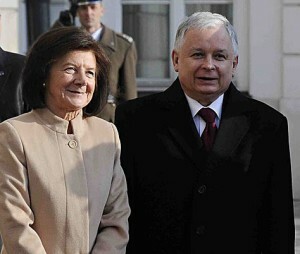 “I was shocked and saddened at the death of Polish President Lech Kaczynski and his wife Maria. “President Kaczynski was one of the defining actors in Poland’s modern political history. From his role in the Solidarity movement to his long and distinguished career in public service - including as Justice Minister, Mayor of Warsaw, and most recently as President of Poland - he will mourned across the world and remembered as a passionate patriot.